Thousands of people showed up at New England Grows this past week. One of the conference’s principal speakers, Bonnie Lee Appleton, unfortunately fell ill and had to cancel her Wednesday talk; for a while the day before the conference it looked as if one of the two convention center ballrooms would be empty for a couple of hours. At the last minute, NE Grows asked Matt Foti to take Ms. Appleton’s place with a talk on bare-root planting. The talk was great — packed with information — and sent a steady stream of people to the Foti Tree and Landscaping booth to learn more about bare-root transplanting. Matt teamed with Teddy and Mike, two of his arborists, to field questions at the booth, which had a good set of air-tool transplant photos, a continually running rough cut of my London Plane video, and two 3-inch caliper Zelkovas from Matt’s nursery. One of the Zelkovas had been dug, balled, and burlapped; the other sat with its bare roots splayed on a sheet of plastic, showing off their extension (they extended about 3-4′ on all sides from the tree trunk), uncut tapers, and web of water-collecting and nutrient-storing capacity. Every now and again one of the arborists would spray the roots with water. It was cool to watch visitors to the booth stop and take in what they were seeing. Some of them shook their heads and moved on; most, though, would watch the video for a few moments, or peer at the photos and the trees and start asking questions. Matt and Timmy and Mike rarely had a moment in the three days when they weren’t answering questions. A couple of questions popped up over and over. Arborists, landscape architects, designers, and contractors all wanted to know how much air-tool transplantation costs. The answer, based on labor requirements, species, condition, and size of tree, as well as on site conditions, was that bare-rooting a tree for transplant may cost more than digging it with a tree spade, but less than digging it with the more traditional drumlaced B&B method. 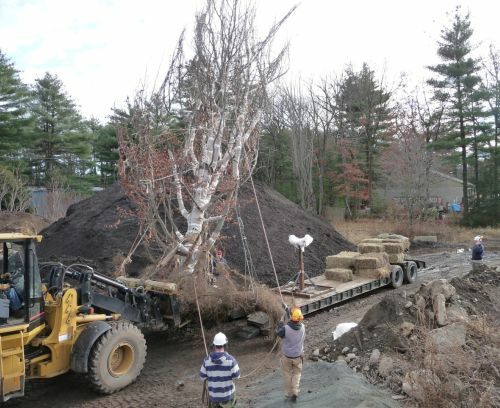 Bare-rooting a tree for transplant typically preserves at least 90% of the tree’s roots, though, a claim that cannot be made for the other methods. The more roots you save, the less transplant stress and the shorter the tree’s reestablishment period — and all other factors being equal, the healthier the tree tends to be after transplant. 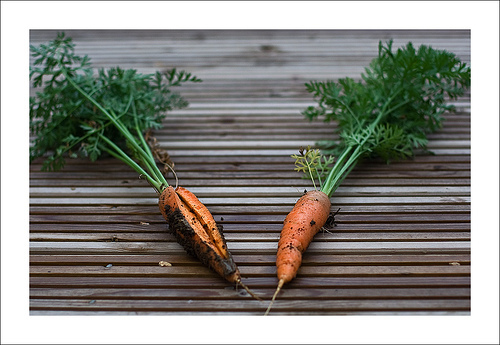 The other question, also coming from arborists, landscape architects, designers, and contractors, was about taproots. 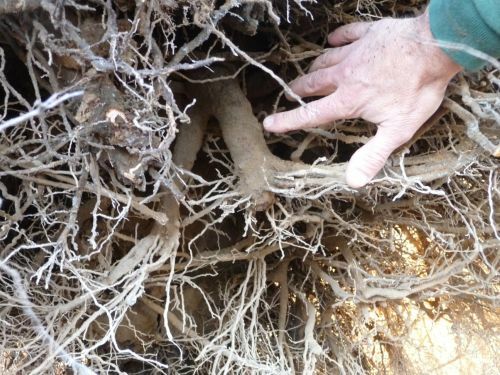 How did bare-root transplant affect a taprooted tree? The answer is that taproots are rarely an issue, at least in this part of the world. In New England, soils tend to be shallow. As we know, trees tend to develop their roots in the top 18″ of soil; the larger the tree, the deeper that zone may go, but typically it extends no more than 3 or 4 feet below grade. Some thick roots do extend vertically down in this zone, but many more run horizontally away from the tree’s trunk. This is one of the thickest roots extending vertically from the beech's trunk. This root was cut in the earlier (20 years previous) transplant; note the resultant root growth just above the cut.